Deir el-Medina, the village of the workmen who built the royal tombs in the Valley of the Kings, is a uniquely rich source of information about life in Egypt between 1539 and 1075 BC. The abundant archaeological remains are complemented by tens of thousands of texts documenting the thoughts and activities of the villagers. Many of the texts are written on papyrus but most are on flakes of limestone which, being free and readily available, were used for even the most casual and temporary of records. They include private letters, administrative accounts, magic spells, records of purchases, last wills and testaments, laundry lists, and love songs. The value of these rare glimpses of daily life is greatly enhanced by the concentration of texts in one time and place. This book combines translations of over 200 of these texts spanning the entire range of preserved genres with stunning illustrations. The reader will, therefore, be able to experience the life of the villagers through their own words whilst viewing places known to each individual writer. 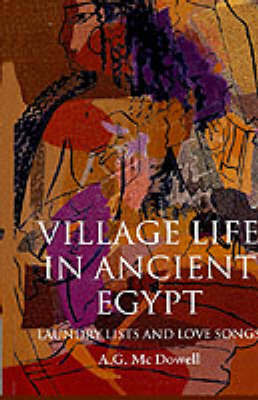 Each text is introduced by a commentary that provides the context and explains the contribution each text makes to our understanding of Egyptian society at this period.